Airing My Laundry, One Post At A Time...: Easy Meal and Deal: EARN $2.50 On Red Baron® Deep Dish Singles At Sam's Club! 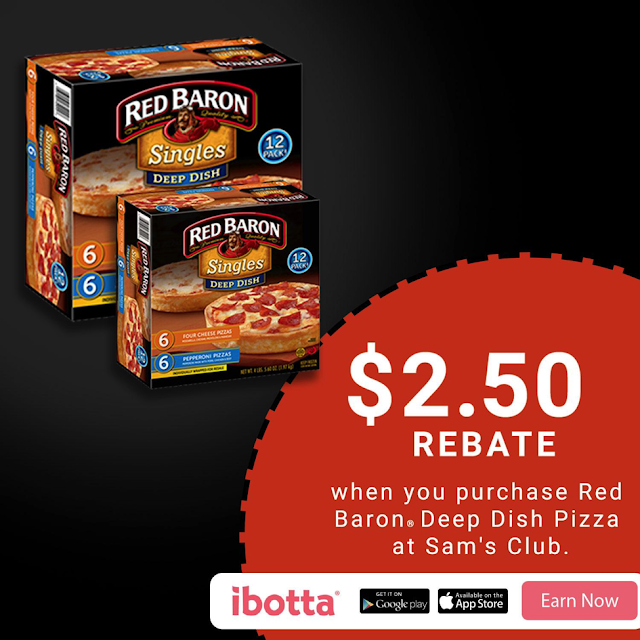 Easy Meal and Deal: EARN $2.50 On Red Baron® Deep Dish Singles At Sam's Club! I've always said I'm all about the easy! I just love when meals are simple. Sam's Club is my favorite place to shop for holiday parties! They always have the best deals and this is a great one. I need to stock up for the holidays. Stocking up on frozen pizza is always a go to when everyone is going in different directions or nobody feels like cooking. Red Baron would be a good pizza to have handy in the freezer. This is my kiddos go to pizza when we get store-bought pizza. It is his favorite. I'm definitely going to use this coupon. I love deep dish pizza, I wish I could use this. I haven't had deep dish pizza in ages. I'll have to run to Sam's and get a box. Deep dish pizzas are so popular in my family! I'll have to get one soon from Sam's!! I like to keep some frozen pizzas in the freezer for busy nights and big snacks. They're easy to make and everyone loves them. Thanks for the heads up on this deal .We love this pizza and always stock up. I will be sure to get some more from the store. I love deals and coupons on grocery! Pizza is always great for movie night! I love deep dish pizza, it is the best! I try to keep a few frozen pizzas onhand at home for those busy evenings when a full blown cooked meal cannot happen. Love Ibotta. Love Sam's Club and love Red Baron pizzas. This deal will definitely come in handy during Winter School Break. Thanks for sharing. It is so great to have frozen pizzas on hand, especially during the winter when it is too cold to go out to a restaurant or the store. Thanks for the discount tip! Ibotta is awesome and so is Sam's. Both are great ways to save money while getting what you need. School will be out soon so better stock! I love pizza and anything with cheese. I think a single size won't be enough for me. Lol! This looks amazing. I haven't been to Sam's club before but I have heard really great things. We love those little pizzas! I would like to save some cash on buying them, that's for sure. We love Red Baron in our home. The boys always get excited about pizza night. The little pizza looks delicious. I would love to try it. Thanks for sharing. With two boys pizza is a staple in our house.So we’re always looking for ways to save money. Thanks for the heads up about the rebate from Sam’s Club. They have a deep dish as well. Wow, didn't know that! Well I might have to let the kiddo try it out next time were shopping. I love Red Baron singles! They are perfect to take to work with me! YUM! It sounds so easy and tasty. Pizza is a favorite dinner around our house! We haven't tried the Red Baron brand yet but sounds like it's time! Looks good. Pizza is my all time favorite no matter where i am. Hearing about this packed pizza for the first time, looks yummy. Wow the pizza looks yummy.. Never tried this gotta try soon.. I love pizza. Who doesn't? What's a dip dish pizza though? Need to Google that. I love Red Barron pizza! It's one of the best go to snacks / meals. My family loves them! I love deep dish pizzas like this, they're so delicious! These are perfect for a quick dinner or lunch option. We always have Red Baron pizza on stock in our freezer. We love their pizzas and it makes for a delicious, quick dinner for those days when work gets really crazy. I have to get these Red Baron Deep Dish Singles too. That Ibotta rebate is fantastic! Thanks for letting me know. I love when I find a deal on these pizzas. They are great for my teens when they have to be home alone while I work. Great deal! Never really tried this food but it sure sounds great. What an amazing deal.